What makes a great cheesecake? Fresh, high quality ingredients certainly play a role; all great bakers use only the freshest and highest quality ingredients available to them. A consistent smoothness is also looked for; surface cracks and clumping are indicators of improper baking or mixing. Each step in the process of making a cheesecake is important. Careful mixing of ingredients and baking of the cheesecake will ensure excellent results. 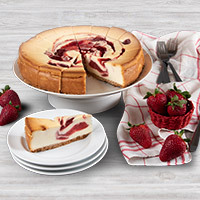 Below are baking tips and suggestions on how to make the perfect cheesecake. 1) Use a springform pan and a water bath. 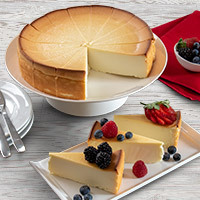 The springform pan works best because it lets you remove the cake easily and the water bath prevents unsightly cracking on the top of your cheesecake. 2) When mixing ingredients, mix evenly to ensure that all lumps in the cream cheese are eliminated before adding the eggs. Eggs generally bring air in the batter, so add them last and stir as little as possible once the eggs have been added. 3) Do not overbeat the cake batter. Once the ingredients are mixed well, stop stirring. 4) Bake the cheesecake at the recommended oven temperature using a water bath. To avoid water seepage, wrap the springform cake pan in foil about halfway up the side of the springform pan. Set the springform pan wrapped in foil in a larger pan containing hot water. The level of the water should not be higher than the foil around the springform pan. 5) Watch your baking time carefully and avoid over-baking your cheesecake. There are several successful methods for determining when to remove the cheesecake from the oven: 1.) When it is slightly moist in the center, 2.) When it has reached an ideal temperature of 160-165 degrees or, 3.) When a small knife inserted in the center comes out clean. If the cheesecake is about done and you are worried about over cooking it, you may turn off the oven and let it sit in the oven for a little while longer to ensure that the cake sets completely. 6) After removing the cheesecake from the oven, run a knife around the edge of the cheesecake. This helps to loosen the cake from the edge of the pan, allowing it to pull away freely as it cools. 7) Allow the cheesecake to cool completely. The cooling step is as important as proper mixing and baking. You should cool the cheesecake at room temperature, away from drafts. Once the cheesecake has cooled completely you should place the cheesecake (pan and all) in the refrigerator for at least 6 hours or overnight. Once it’s thoroughly cooled, it will be much easier to remove the springform pan and it is ready to serve to your guests. 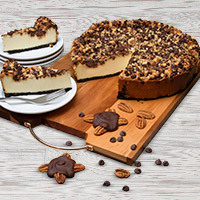 Surface cracking is the primary complaint of those who bake cheesecakes. Cracking can occur for many reasons – absence of a water bath, too much mixing of the batter, adding the eggs too soon, adding eggs to lumpy cheese, or if the cake has not been loosened from the pan at the start of the cooling process. Flour or cornstarch is sometimes included in cheesecake recipes to preventing cracks. If you find that you always have problems with cracking and your cheesecake recipe does not call for any flour or cornstarch, it’s ok to experiment and add some cornstarch (one to two tablespoons) to the batter when you add the sugar. 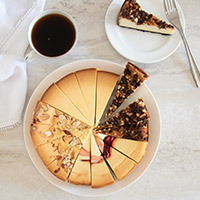 By following these baking tips you can be assured that your homemade cheesecake will look appetizing, taste delicious, and have your family and friends asking for more!